So I got on one of my obsession kicks today, this time about the history of couture fashion. 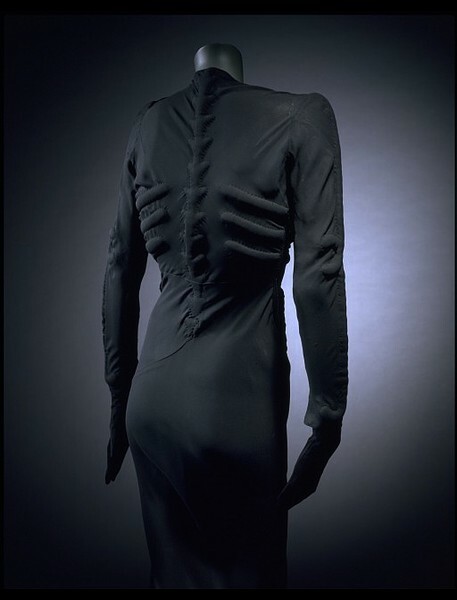 I spent a good 6 hours reading about the genius of Elsa Schiaparelli, whom I knew for her invention of shocking pink (yes, she actually invented a color, at least when it comes to couture) and for her amazing collaborations with surrealist artists which resulted in masterpieces like the Lobster Dress (Salvador Dalí painted that lobster onto the fabric), the Skeleton Dress (it caused a scandal when it debuted in 1938) and the Shoe Hat. What I didn’t know is that she invented so many other things that we now take so much for granted that we don’t even think of them as having been invented, really. Things introduced to the world of high fashion by Elsa Schiaparelli include square shoulders combined with nipped-in waistlines, wacky prints, graphic patterned sweaters, jackets to wear with evening gowns, the long runway walked by tall, thin models, ready-to-wear boutiques for couturiers, sportswear mix-and-match separates, colored zippers, the wrap dress, the skort, man-made fabrics and the wedge heel. Schiaparelli’s couture house closed in 1954. She wasn’t able to roll with the post-war times despite having been at her most brilliant in the interwar period. That same year saw the rebirth of the signature line of her greatest rival, Coco Chanel. Chanel, who had kept under the radar since her couture house closed after the German occupation of France (she had been a Nazi officer’s mistress and was not exactly beloved in France after the war despite her own innovations and contributions to French fashion), would come to eclipse Schiaparelli in popular reputation, although not among couturiers, many of whom have borrowed liberally from Elsa’s artistic genius over the decades. If you’re at all interested in fashion history, or even just like looking at purty dresses, take a romp through these galleries: the Philadelphia Museum of Art’s 2004 exhibit, “Shocking! The Art and Fashion of Elsa Schiaparelli,” and the Victoria and Albert Museum’s awesome interactive timeline of the Golden Age of couture, which does an excellent job showing the links between famous couturiers, so many of whom started as cutters and pattern-makers under other famous couturiers. ETA: Rowan pointed me to this article on a new exhibit at the Los Angeles County Museum of Art on the history of European fashion from 1700 to 1915. It opens on October 2nd and runs until March 6th. Meanwhile, here’s a photo gallery of some of the gloriousness. I’m completely in love with this dress from England, around 1885. This entry was posted on Sunday, August 29th, 2010 at 11:14 PM	and is filed under Modern(ish), Multimedia. You can follow any responses to this entry through the RSS 2.0 feed. You can skip to the end and leave a response. Pinging is currently not allowed. Another exhibit that corresponds to current couture designers, i.e. John Galliano, looking at museum collections for inspiration opens at LACMA on Oct 2. It runs through March 2011. ‘Fashioning Fashion’ at LACMA’s Resnick Exhibition Pavilion is the article by the L.A. Times with a slide show of some great clothes which will be on display. I love how there are items we consider modern which really are not, such as the black leather corset and thigh high boots from 1900. Oh fantastic! Thank you for the link. I’ve added it to the entry on account of the awesome. Sigh, past fashions always make me feel anachronistic and envious. I was not built for today’s clothing styles, which is why I pay no attention to present couture. Wallis Simpson, Duchess of Windsor, wore it so it’s probably seen some killer cocktail parties. I’d go for the french gown that’s diaphanous. It looks relatively comfortable. Which gown do you mean? I am chartreuse with envy. 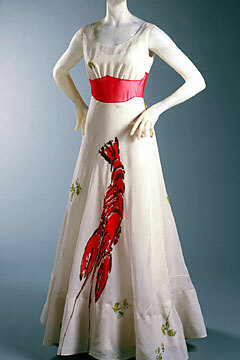 Elsa Schiaparelli was a brilliant fashion artist. She was an innovator of many ‘firsts.’ I was so impressed with her life story I athored her obit on the ‘FIND A GRAVE’ site. Schiaparelli’s two granddaughters have had remarkable lives – one an actress and model; the other a gifted photographer (The latter died onboard one of the 9-11 planes that hit the World Trade Center). This was a remarkable family – but the grandmother was the apex of talent!